The last think you want to do on a 7 day soup diet is run out of option. When you are not eating vegetable soup, the key to getting through is opening the door to new ideas. The 7 day soup diet not only gives you vegetables you need to max out on nutrition but helps you burn fat helping your lose weight eating. Like other soup diets, the vegetable soup diet is geared for weight loss. How do I start on a soup diet plan eating vegetable soup? Just when you were getting tired of the same old diet, there is always the 7 Day Soup Diet plan waiting for you to try out. 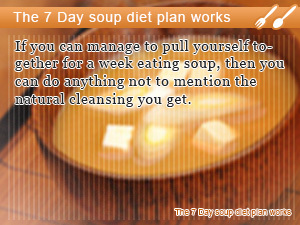 In this 7 day plan there are days when you boil and eat meat. 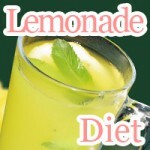 Overall, it's a great diet plan. When it comes to burning fat, the 7 day soup diet is worth giving it a shot. Just so you know, it is the soup diet that never ceases to amaze in variety and results you can see after losing weight eating. In this healthy Slism, we introduce the vegetable soup diet for 7 days giving you a plan of action to get the beast out of your fat burning soup diet. What makes the 7 day soup diet so attractive is that there is a concise plan making it easy to get through because you already know what you are going to eat well in advance. This alleviates the hassle of planning meals out that can be a struggle in itself. As for a healthy diet plan, the menu of foods you see in the 7 day vegetable soup diet may be more than you asked for. The 7 day soup diet is split into separate days each with their own food groups that you will be concentrating on eating. It may seem like a lot at first but as you fill find out throughout the course of a week you can't say you didn't get enough to eat. On the first day you are going to stick to eating soup and fruits. Eat as much soup as you like. However, that doesn't mean you don't have to set limits for the amount of food you eat. Keep it under 80 percent of what you can really eat. Develop a sense of what is good for your diet and eat it. Whatever you do, stay away from eating bananas. On the second day you are going to concentrate on eating soup with vegetables. Whether you eat steamed vegetables are raw vegetables, there shouldn't be a problem. Just stay away from frying with oil. On this day you are going to add a little extra to your evening meal. That is either Satsumaimo Japanese sweet potatoes or Jagaimo potatoes. Any tuber works! Don't forget to keep your diet in mind. Day 2 is the only day you are allowed to eat baked potatoes that depending on the preparation method is 130 calories per potato. Eating 1 baked potato versus 3 is highly recommended. The third day is filled with soup, fruits, and vegetables. Notice how day 3 is combines day 2 and day 1. This will make it easy to figure out what you eat. Like day 2 where you concentrated on eating vegetable, avoid fatty foods cooked with oil. The same goes for bananas. Whatever you do don't eat bananas. You will see why as you move through the 7 day diet plan eating soup. On the fourth day you are going to finally get to eat that banana you put aside for later. Eat soup and bananas topped off with 500mL of milk (fat free or skim) for best results. Have a banana with every meal. That means you are allowed 3 bananas a day. Don't push it. As you would expect, a banana isn't going to be enough to pin down your appetite. That's where soup comes in. Having a healthy bowl of soup puts you over the edge for enough to push hunger pains aside. It's day 5 and finally time to start eating meat! As you would expect from eating only vegetables and fruit, your body is starting to feel the effects of lack of protein and fat in your diet. In fact, you may be feeling a little dizzy by now. You are going to need to get some animal protein in your body right away, this instant! Just because you feel like you can eat a cow after obtaining from eating meat for 4 days straight doesn't mean you can't mix it up with soup containing meat such as chicken soup or beef stew. In addition, to getting more meat in your diet, eating tomatoes may be a good idea. As long as its within 6 tomatoes you have nothing to worry about. In the sixth day we revert back to soup, veggies, and… yes meat! To be precise you are going to want to pick up some stake. It doesn't matter how much you eat as long as it is within 2 to 3 stakes. The amount of veggies you eat doesn't change, except for the part of not eating potatoes. This is not a day to be eating potatoes. Keep it under control. On the last day you finally get to eat some carbs. That means busting out your favorite bread or bowl of rice. In addition to getting back on board eating carbohydrates you are going to want to pick up some 100% fruit juice, vegetables, and carbs to complements the soup you will be eating. Vegetable soup due to the fact that it is low calorie is the foundation of soup diets. Eating low calorie soup not only helps you cut back on calories but gives you room to satisfy your appetite without feeling guilty after eating. The best soups for your diet are said to contain tomatoes, carrots, onions, green peppers, cabbage, or celery. Any soup contains any one of these vegetables should be added on the list of soups that are going to make you 7 day soup diet work. For women with chills from time to time, having a bowl of soup helps you warm up your body increasing your core body temperature firing up your metabolism. In addition to keeping preventing chills, you cleanse your body. Warming up your body improves circulation in your body. With better circulation, you have what it takes to flush out impurities getting a natural cleanse simply by eating soup not to mention the fiber. When on any diet there are always things you have to worry about like what to and not to eat. The 7 day soup diet is no different. Here is a list of precautions that may help you get through the week. Stay away from sweets. You are supposed to be on a diet. Don't let your sweet tooth ruin it for you. Minimized the amount of wheat you eat, less bread and especially no cookies. Limit the amount of alcohol you drink. After a day of drinking wait 24 hours before having another drink. Hydrate your body when needed. Drink tea, water, or black coffee to make it through. Only drink 100% fruit juice. When you want to continue after the 7 days of your diet are over, wait 2 days before starting over again. Vegetable soup makes a great low calorie meal idea whether you are eating late or looking for ways to cut back on calories during lunch. Vegetable soup diet. If you can manage to pull yourself together for a week eating soup, then you can do anything not to mention the natural cleansing you get. Can you eat soup for a week? 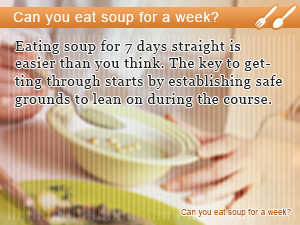 Eating soup for 7 days straight is easier than you think. The key to getting through starts by establishing safe grounds to lean on during the course. Hot foods such as steaming vegetable soup do more than satisfy your appetite. They warm up your core boosting your metabolism fast.